This recipe comes from an idealistic young French chef, François Bogard, at the Château de Chaumont in the Loire valley. His ingredients are left to grow naturally with only organic fertilizer and a minimum of irrigation, and in his recipes even the water comes from a bottle so he knows the source. There’s nothing Spartan, however, about his use of cream! Sorrel or watercress can be substituted for nettles, and the soup can be served hot or cold. The former kingdom of Savoy borders the Alps and includes Mont Blanc, the highest mountain in Europe. Appropriately, this hearty soup is creamy white and full of root vegetables, bolstered with plenty of cheese. The local tomme de Savoie is an aged, slightly piquant cow cheese, good for cooking as well as enjoying with bread; Gruyère can take its place. 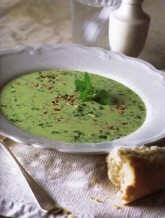 Serve the soup as a vegetarian main course, in generous bowls and accompanied by country bread. The richness of pumpkin and the hearty onion flavor of leek have long been favorite partners in French soups. In 1766, when traveling through Burgundy Tobias Smollett wrote, “I observed a vast quantity of very large pompions (pumpkins) with the contents of which they thicken their soups and ragoûts.” French pumpkins are larger than most in the United States, so here I call for a piece rather than a whole pumpkin. Now that duck liver is produced in farmhouses all over France, the festive addition of a sliver of foie gras is almost expected!